Sunday blogging against racism #48–Queen Nzinga and being a resistor | I wanna love You better whatever it takes . . .
A few weeks ago, on our trip to the Dusable Museum of African-American History in Chicago, said birthday girl drew my attention to a picture of a queen from the part of Africa that is now Angola named Nzinga. 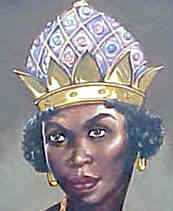 Wh at caught her eye was that Nzinga entered into an alliance with the Dutch in order to work towards freedom from Portugese colonization. In our anti-racism work, we talk about racism, of course, but we also talk about the “resistors”, people throughout history who have gone against the almost insurmountable tide of racist behavior and actions to speak and act in ways that wounded racism . . . and of course, we don’t want to make the white folks the heroes, but I must admit that I did appreciate the fact that the alliance she formed was with the Dutch . . .
And while we’re at it, here’s a cool poem about Nzinga as well . . .